We’ve looked before at the work of MIT biology research affiliate Joe Davis, whose passion is the melding of science and art. Among his many ideas are the creation of an ‘infogene,’ engineering a sign of human intelligence into the genome of bacteria that could be flung into the heavens by the trillion, and a three-masted Gulf Coast tower that would discharge laser beams into the sky. In 1986, Davis used MIT’s Millstone radar to beam a signal to Epsilon Eridani, Tau Ceti and two other stars. 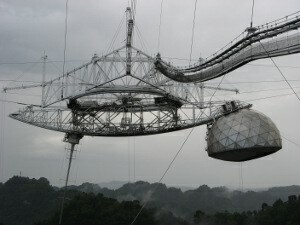 His most recent adventure takes him to the great telescope at Arecibo. It involves the 35th anniversary of the Drake/Sagan transmission to M13, a messaging strategy based on molecular biology, and the emergence of the coolest iPhone in the world. I traveled from Boston to Puerto Rico on 03 November to deliver a lecture for the University of Puerto Rico’s Biology Colloquium (Rio Piedras campus) in San Juan. I also planned to meet with Arecibo Observatory interim Director, Dr. Michael C. Nolan to propose a project that would coincide with the 35th anniversary of the famous message for extraterrestrial intelligence that was transmitted into space from Arecibo by astronomers Frank Drake and Carl Sagan in 1974. Poetic and philosophical implications underlying the scientific search for extraterrestrial intelligence (SETI) have marked much of my work and career as an artist. In the 1980s, technical problems associated with the use of radar and spacecraft as message-transmitters inspired me to develop prototype bacterial carriers of generic information that could survive for very long periods of time in the harsh environments of space. That is how a subject as vast in scope as the search for extraterrestrial intelligence ultimately brought me to the study of molecular biology. Image: Arecibo close-up. Credit: Ashley Clark. In 1974, molecular biology was entering its “golden age”. Part of the Sagan Drake message was encrypted with a rudimentary likeness of the DNA double helix. The hereditary role of DNA was then well known – as were two of the three principal conformations of its molecular structure – but the triplet operation of the genetic code had only recently been unraveled and modern techniques for DNA sequencing were still a few years away. The first genes (DNA) were sequenced in 1977 and the first recombinant organisms were produced in Herbert Boyer’s laboratory (UCSF) in 1978. In 1974, there was no genomic science at all. While messages were being transmitted to extraterrestrial intelligence no one knew that genetically speaking, human beings are 70% identical to tomatoes. In 35 years since the Sagan-Drake transmission from Arecibo, radar antennae all over the world have more or less routinely searched the sky for unambiguous signals from advanced extraterrestrial civilizations. The SETI@Home project, organized by the Space Sciences laboratory at UC Berkeley has allowed millions of lay enthusiasts to participate in SETI sky surveys by donating processing time on home computers. 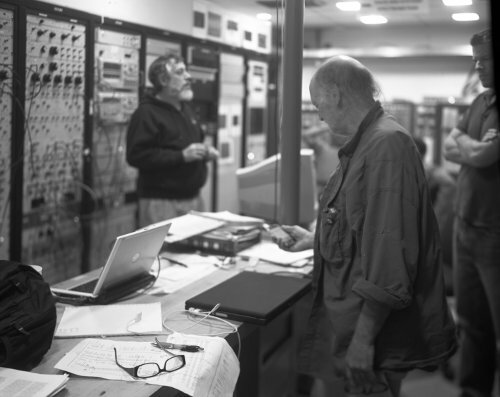 Various amateur and commercially motivated transmissions have taken place, but such transmissions have been insufficiently powerful and arbitrarily or naively composed by groups and individuals from outside the formal, scientific community. No federal funds at all have been allocated for SETI searches and with the possible exception of Poetica Vaginal (ca. 1986), for almost 35 years, no serious scientific radio messages for extraterrestrial intelligence have been transmitted into space. In late October of this year, I contacted members of the astronomy community at Cornell University for referrals to scientists and administrators at Arecibo Observatory (Cornell operates Arecibo Observatory under contract with the National Science Foundation). My objective at Arecibo was to carry out transmission of a new message to extraterrestrial intelligence on or around the 16 November anniversary of the 1974 Sagan-Drake transmission. To prepare for meetings at Arecibo Observatory, I organized recommendations and letters of support for the project from respected members of the international academic and research communities that were sent to Arecibo’s director on my behalf. Among these were recommendations from Dr. Irving Vega of University of Puerto Rico Biology and his Department Chair, Dr. Carmen Maldonado, art historian James Elkins, astronomer and editor, Dr. Roger Malina, CalPoly physics Prof. Peter Scwartz, University of Washington art historian, Marek Wieczorek, scientists from the biology community here in Massachusetts and abroad, members of the astronomy community at Cornell and others. 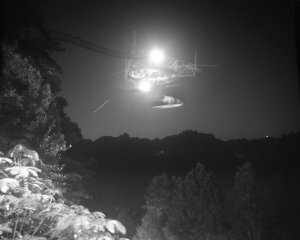 Image: Arecibo at night. Credit: Ashley Clark. All living things are made of protein and the most abundant protein on Earth is called RuBisCo (ribulose- 1,5-bisphosphate carboxylase oxygenase). It is actually quite an interesting protein. To quote Wikipedia, it is “an enzyme that is used in the Calvin cycle to catalyze the first major step of carbon fixation, a process by which the atoms of atmospheric carbon dioxide are made available to organisms in the form of energy-rich molecules such as sucrose.” It is also interesting in that it actively selects against 13C, one of the naturally occurring stable isotopes of atmospheric carbon, in favor of 12C. The difference of course, is only a single neutron. I pointed out that certain technical shortcomings of the 1974 Sagan-Drake transmission could be avoided with a follow-up transmission. I also found candidate stars that would be located in the Arecibo “window” (above 20 degrees from the horizon) in the first weeks of November (gleaned from online sky maps and SETI Institute Jill Tarter’s and Margaret Trunbull’s list of candidate ‘nearby habitable stellar systems’). I established that aspects of the galactic rotation of target stars (which actually negated the Sagan-Drake effort) would be inconsequential when targeting stars located less than a few hundred light years away from the sun. My friends at Cornell also suggested that since our best bet at finding ETI would be ones that are already quite sophisticated, targeting infrared sources in our galaxy that have no corresponding optical object should also be considered. Although I personally remain rather skeptical on this point, these objects could be Dyson Shells or other similar ETI astroengineering projects. The online data set of the IRAS could be used to identify such sources. I proposed that a short message containing the RuBisCo sequence could be transmitted during some brief interval between scheduled ongoing use of Arecibo Radar or that it may coincide with periods set aside for checks and maintenance. I was also advised incidentally, that no special ceremony or event was planned to mark the November 16 anniversary. I arrived at Arecibo Observatory on Friday, 06 Nov. with several companions who had flown in to participate in the project. My companions included Jonathan, Pam and Rhode Island School of Design Prof. Emeritus, Al Wunderlich, film maker Peter Sasowsky, photographer and collaborator Ashley Clark and Belgian art historian, Danielle Hofmans. The amazing thing is, we did it with my iPhone! Image: Joe Davis pondering transmission options as he holds the possible answer. Credit: Ashley Clark. Arecibo’s “coder” (a device that interrupts the 2 Megawatt radar signal at precise intervals) was down. Use of that component would have been the most obvious way to input data that would be reflected in Arecibo Radar’s transmitted signal. Creative solutions were called for. Inspired in part by techniques I used 25 years ago to interface with Millstone Radar for the Poetica Vaginal transmission, we converted the 1434-mer RuBisCo sequence into an analog audio file that I recorded on my iPhone. Then, we actually interfaced my iPhone with Arecibo’s powerful radar and transmitted from approximately 11:30 p.m. until 12:45 a.m. (see attached pictures). The duration of each transmission was approximately 5 times longer than the 1974 Sagan-Drake transmission. Now I have the coolest iPhone in the world. How best to send out a gene as a coded signal? More on that tomorrow, along with a look at ways to add additional information to the original message. Do the stars mentioned in the article indeed exhibit similar Lithium content as our sun? I hope that we are not targeting the wrong stars. I was unable to find a reference of the amount contained in the target stars. The “Garik” property of a star is likely to provide a reference to help choose stars for future Sagan-Drake transmissions. There are “billions and billions” to choose from, lets choose wisely. – RuBisCo is just one among thousands of equally essential proteins. Why not the photosystems which actually capture light and transform it into energy? Or DNA polymerases, which are responsible for the replication of genetic information -the essential mechanism at the basis of the very definition of life? – Protein sequences have nothing universal. They are shaped by evolution, just like morphologies, only in a more direct way. The protein sequence will say nothing essential about our world apart from, maybe, “we use inorganic carbon”. Which is kind of a moot point, since if you send them a protein sequence, they already know we’re a carbon-based ecosystem: proteins are carbon-based polymers. Also, to understand the sequence, they need a aminoacid letter to aminoacid structure key. – DNA sequence is even less universal, since it requires knowledge of the genetic code to be understood. And there’s no good evidence it is a universal code. Thus, the protein sequence could have helped the ETIs build the actual molecule. The DNA sequence means absolutely nothing without the genetic code: it’s kinda like sending them a cryptographed message without the key. In short: It is, for the receiver, a purely useless sequence of gibberish. Even if it contained a key for understanding (and it would require sending them the genetic code + the structures of all 20 aminoacids) , it would just let them syntethize a protein molecule, which tells them not much more than what the very fact that’s made of aminoacids already says: we’re made of carbon. Have to agree with devicerandom here, this is a particularly pointless message to send, given the entire thing would be meaningless at the destination. Chronic lack of actual biologists in the SETI/METI movements. Could also do with a few more anthropologists as well. Nice choice of stars too… GJ 83.1: flare star. Teegarden’s star: very dim M dwarf, poorly studied. Kappa Ceti: apparently affected by “superflares”. Poor astronomy as well as poor biology? Your points are well taken. Perhaps, we should transmit just pure noise… But wait… Does we know the frequency that “they” can register… Then, we should ask ourselves: why we can’t communicate with other animals or plants in our own planet? I have to agree with what devicerandom and andy are saying. Assuming that any potential receiver of the message would be able to make any sense of all the A’s, C’s, G’s and T’s in that message (if indeed that is how it was sent) is a rather large assumption to make. Not to mention the fact that while this molecule may be of great significance to us, it could be meaningless to anyone else who receives it. Dr Irving, I understand the need to “search” for ourselves, but there has to be a better way than to pollute the stars with random gibberish. Any information we send out with even the slightest hope that it may be received by some other intelligence should be meaningful in some way, not just to us but to the receiver too. While sending out pulses counting prime numbers or the value of PI may say that we have the ability to understand that type of maths and have the capability to send it across the universe, it doesn’t distinguish us from where we are now compared to 35 years ago. I am in no way qualified to decide what should be sent, which is why this reply is simply my opinion on the matter, but sending something scientific which describes something about our level of scientific knowledge in a universally understandable format is what should be broadcast in my humble opinion. Need to send a message to a potential extraterrestrial civilization? There’s an app for that. Hmm. I can see it now; a cloud one billion (or more) caltraps made outta depleated uranium screaming twords our system at o.5 relitive (or more). If any of these target systems are house for cute-fuzzy tribbles who disagree with the concept of humans in the same galaxy as them, then we might one day get a very nasty response from our blitherings. Don’t get me wrong, I’m all for trade, co-exploration and partying with our co-galactic dwellers, but we don’t even have a telescope up at 550 AU+ to even begin to look at/into posible target systems or even the will to establish a moon colony or semi-self sufficiant micro colony cappable withstanding the riggors of our own radiation belt. And lets not forget about that fluffy cloud of 6,000 deg. C gas thats gonna be buzzing past Sols heleosphere for the next 20,000 years. I sometimes feel as though humanity is the personification of Daedelus, and it is to be forever imprisoned in its own labyrinth but has, as yet, not thought of fabricating wins to escape…or is that goverments doing? What do I dream of: A solar system of eyes! I would love to see a telescope/communication relay system in every L4 and L5 position that we can land them in (or more); And a mini dyson sphere about the sun of similar devices at 550 AU+ (or whatever distance floats the boat) that can look into our closest neiboring systems. A VLBA-type telescopic system the surface area (variable) of the solar system would be one impressive all-seeing eye! Ah, to dream…We really should look before we leap and get some bases growing too…least we get sucker punched. To quote Heraclitus, “The Lord whose oracles are at Dephi wishes neither to conceal nor to reveal, but rather to signify.” RuBisCo is just one among thousands of equally essential proteins and it is by far the most abundant protein on Earth. That’s significant. Happy, “Goldilocks” planets may very well characterize only one of the environments where life can thrive. In the decades since the 1974 Sagan-Drake METI, many organisms have been discovered thriving in extreme environments well above the temperature of boiling water and at temperatures below freezing. Some live in environments more acidic than automobile battery acid. Some live at enormous pressures and some, perhaps even most life on Earth, live deep in the subsurface, chemophages never touched by light of day. Stefan Wolfl and I have personally isolated organisms thriving in the primary coolant of the nuclear reactor at MIT. Life may in fact have no special predilection for Earth-like “habitable zones”. Stars that are just right to support life might easily turn out to be dimmer and longer-lived than the sun. In any case, GJ 83.1 is no. 34 in the Tarter/Turnbull ranking for the nearest 100 list of SETI target stars. Like Sagan and Drake on a date in November 35 years ago, we were also constrained to select stars in Arecibo Radar’s “field of view”. Slight variations in the so-called “universal” genetic code are known in some terrestrial organisms but there are far more similarities than dissimilarities. Nature is very, very clever and she holds a stingy purse. She will spend the least amount of energy to do whatever it is she has to do, including tending to the manipulations of codons and amino acids. Odds are we will find life based on carbon polymers (nucleic acids) simply because they are energetically easier to manipulate than other polymers. Biological machinery working on these polymers, like ribosomes, transcriptases and polymerases (or their analogs), will also be constrained to be the most energetically efficient operators and so, may be at least in general terms, more or less predictable. ETI may indeed operate with a wildly different “genetic code” than the ones we know, but my impression is that such whole scale variation would be extremely unlikely. Still, the fact is that an alien intelligence is unlikely to understand the actual information content of any signal we send, other than to determine it is non-random, worth paying attention to, and perhaps replying to. In this regard, our coded signal did have information content because it was composed of four distinct sub-signals that could not arise from a natural cause. First, space is really, really, REALLY BIG and theoretically, the universe has been in existence for about 13 billion years, which is a really, really – you get the gist of it. Therefore, for there to be another civilisation at a similar stage in development nearby and right now (assuming that civilisations are very common – which is not a given), is unlikely. Secondly, and following on from the first point, if the civilisation is just one hundred years behind us (technologically), then any message we send, will fall on deaf ears – never mind its content. If however the civilisation is one hundred years (or more) ahead, it will most likely ignore us. What is in it for them, apart from maybe conquest and exploitation? Third, if a technologically superior civilisation did contact us, I would question their motives. In almost every case in our history, where a technologically superior people have interacted with less technologically developed people, it has led to disastrous consequences for the less developed people. Either by malicious means or by chance (guns and germs in the Americas) the less developed culture is crushed or subsumed. Fourth, we as a civilisation are definitely not ready for contact. We squabble over everything and anything, and agree on nothing. Any contact will lead to greater divisions and eventually war over what should be done – be friendly, be hostile, to care, to not care, build up armies to defend ourselves, unite, who should lead and so on and so on. Personally, I feel that we should pretty much mind our own business and concentrate on improving our lives. This is not an anti-techno rant, rather the opposite. We should concentrate on creating a society that is built on equality and one that places the greatest import on quest for knowledge – not money or power. This would of course include the exploration of the cosmos and if somewhere down the line we encounter other civilisations then great! If not then great. I hope, that if we encountered a civilisation that is technologically behind us, then we would have the wisdom to leave them well alone! I feel that the possibility of life, even ETI civilizations should not be discounted for planets within the habitable zones of Red Dwarfs, even though models indicate that M-class stars might produce dangerous superflares. Even in the event that such planets might be tidally locked with one side always facing the parent star, it might be possible that atmospheric convection, ocean currents, and the like could cause heat transport to the dark side of a tidally locked planet to the extent that life evolving condition could arise in STP like aquatic, land, and atmospheric environments. ETI organisms that might have evolved on the dark sides of such planets might see in infrared quite adequately. ETI persons as such might have evolved very large eyes for high resolution utilizing the longer IR frequencies with respect to what is visible light to humans. The closest Red Dwarf is Barnard’s Star, a good candidate for beaming signals and for precursor manned interstellar missions. many organisms have been discovered thriving in extreme environments well above the temperature of boiling water and at temperatures below freezing. Some live in environments more acidic than automobile battery acid. Some live at enormous pressures and some, perhaps even most life on Earth, live deep in the subsurface, chemophages never touched by light of day. Stefan Wolfl and I have personally isolated organisms thriving in the primary coolant of the nuclear reactor at MIT. Life may in fact have no special predilection for Earth-like “habitable zones”. I’ve always been curious about the validity of this argument, because it seems clear that, in most of those examples, abiogenesis did not happen in such environments — the organisms in question evolved from much more “benign” surroundings, and only colonized those extreme niches after they had their basic machinery in place. This is much like humans living in all sorts of environments that would not have allowed us to evolve originally, and in which we cannot survive without innovations that we have produced well after the development of Homo. Humans can live under the ocean, or in Antarctica, or even in space, but human life could not have developed there. We required a much more gentle environment in which to evolve before we could colonize those habitats. In other words, while organism may be able to survive in such environments, I’m not sure that life can arise in such environments. So, we are afraid of “aliens” because we think they’re like us? Also note the great mystery is the unitary occurrence of life, though there are a couple of teams scouring the planet for evidence to the contrary. It has never happened again despite much more benign circumstances. Admittedly that are all kinds of weak untestable work around’s. Also the circumstances for life is distinct from that for complex life and very different from that for intelligent life. Joe Davis: you are trying to have things both ways. What you have done is encoded a message that is specific to the local biosphere in an encoding that is specific to the local biosphere. You don’t then get to start claiming that environments very different from Earth may have life – sure this might be the case, but it is very far from clear that such environments would produce the same DNA system that life on Earth uses. For a start, there is nothing particularly special about the bases in DNA: for example RNA uses uracil instead of thymine, which suggests that even similar systems for heredity may use very different sets of bases. There are surely more universal messages that could be transmitted, which don’t have such a reliance on the convergence of biospheres on the exact same mechanisms. It seems that the interpretation of the work has been taken too literally. I believe that any non random message is sufficient to draw attention. However, given the work is primarily in the spirit of humans self reflecting we should consider how, at least amongst this audience, the Rubisco message has been met with some disagreement. Perhaps, given the comments, the design of a thermonuclear weapon, or the code of a weaponized virus would have spurred the reflection such a work could provoke. ETI may indeed operate with a wildly different “genetic code” than the ones we know, but my impression is that such whole scale variation would be extremely unlikely. You’re confusing planes truly badly here. One thing is to say that most life will be made of carbon polymers, something that I agree for chemical reason. I also agree that DNA-like and protein-like molecules are probably going to be common, though I wouldn’t be surprised by… some surprise. But a completely different thing is to say that the triplet-aminoacid code we know will be universal. There is no known good physico-chemical reason for which AUG is strongly selected to encode methionine , while AUA should be selected for isoleucine. There has been some publication on the argument which hypothesize some kind weak relationship, but it’s mostly thin air. Still, the fact is that an alien intelligence is unlikely to understand the actual information content of any signal we send, other than to determine it is non-random, worth paying attention to, and perhaps replying to. Again, no. At least, it is relatively easy to craft a message which is much more likely to be understood. Have you ever looked at the 1974 Arecibo message? Not perfect by any standard, and full of assumptions, but at least it is something. If you really want to send something, send -repeatedly- a large primeXprime matrix of signals of different discrete intensities, and let them form a black-and-white bitmap image. Much more immediately informative than a gibberish sequence. Actually, one of the more plausible theories of the origin of life put it deep undersea, at several hundred degrees C, enormous pressure and in the absence of sunlight. The likely source of energy were hydrothermal vents, both for chemistry and for heat. Ultimately, this energy comes from radioactive decay inside the Earth, not from the sun. If this is true, life as we know it could happen anywhere there are planet sized bodies with water, even in the absence of a star. tool of that system with a few extra devices of his own. among the technological civilizations of the galaxy. It is not about being afraid of the “aliens” because they might be like us. I’m mostly afraid of the impact, of making contact, on us. Let me put it another way. I don not trust us. We are not mature enough as a civilisation. If a technologically superior civilisation do make contact with us, what is it we expect. Do we expect all of our problems to be solved? Do we expect to be given new technologies allowing us to do miraculous things? It is unlikely that any of those things would come to pass. Even the best case scenario of making contact and then the other side keeping ‘stum’ thereafter, is less then desirable for us. It will like breed anarchy. To wish for a bearded bloke in the sky or little green aliens in this case, to solve our problems is childish. We have to earn technologies by our own endeavours. History is littered with cases where the introduction of new technologies, to less technologically developed factions, subsequently leads to more efficient killing of people. My two cents: since the fundamental laws of nature and matter are omnipresent (i.e. throughout the universe), the cosmological principle, it is also extremely likely that all biological life or at least all higher developed (multi-cellar, specialized organs) life is based on carbon (C) and water. Only C can form complex macro-molecules necessary for biochemistry. Silicon (Si) can do this also but to a much (MUCH) more limited extent, paling in comparison with C. It is no coincidence that all life on earth is C-based, although Si is much more common. Just as it is no coincidence that nearly all life on earth lives under relatively ‘temperate’ conditions, the extremophiles being exactly that: the extreme exceptions. I dare to go even one step further: likewise, it is no coincidence that we orbit a yellow G-star, despite the fact that at least 70 – 75% of all stars are red dwarfs (M), even more if you include late K stars. People often say that ‘statistics of 1’ means nothing, but I strongly disagree here, this isn’t just a sample of 1, it is a sample of 1 against the odds. On earth we’ve had a 4 billion years selection for Earth-like conditions, so it’s no surprise that most life is optimized for the moderate temperature and pressure, here. If life arose as Eniac mentions, and the environment stayed much hotter, life would be adapted to that environment. Whether any complex, and even intelligent life would be possible, is a big guess. One of the more plausible forms of life is based on silicon and metal. Instead of proteins and DNA, it would be made of machines and microchips. Silicon based, but not in any way depending on biochemistry. This form of life has a huge advantage over that which is carbon based: It’s raw constituents are much more common, it’s organisms eat rock. I believe we are on the verge of creating such life. In fact our industrial economy already constitutes such an organism, albeit one that is not yet autonomous. Carbon-based life is still required for it to function, but is this an iron-clad necessity? Not anymore. With modern information processing and automation technologies, the only thing we humans really have to contribute is a purpose, which is not necessary for life to exist. Just to point out in this discussion of silicon versus carbon, in terms of catenation ability (forming long chain molecules), after carbon, second place goes to sulphur, not silicon. The S-S single bond is quite strong, which allows for various rings and chains to form. Branching is something of an issue though. Druyan commented it was a nice idea but it would also be bragging. on a literally universal basis that it takes up a fair part of the disc. understandable to an alien mind? effort was that he was able to do anything at all at Arecibo. part of it in every sense of the word. Tesh, I am in agreement with you. Our civilization is not ready for a first contact situation. We are arrogant, greedy, and presumtuous and I think any space-fairing species worth their salt would see that before every setting foot near our planet. At the same time, as Joe stated; the message that was sent did not reveal, and did conceal (which is the best kind of message for an unknown receiver). Even if our data is meaningless to the receiver, the fact that it IS a message may be enough to spurn hope, wonder, and a sense of unity on an interplanetary scale (or even galactic scale if the other party is in contact with other worlds) sort of like an intergalactic party-line :). If we were to receive a response, imagine what it would trigger in the intelligent on this planet?! I am an optimist for these scenarios, and I would hope to see people united with a common goal, or with the notion that we are not alone in our galaxy, or in our struggle to survive the challenges that face every sentient being. Perhaps a interplanetary pen-pal would be established :) Mind you a pen-pal that could only response every couple hundred years, but I’ll bet humanity would be waiting with baited breath for every response no matter how abstract or meaningless. I would. To those who say we should be ready for any contingency, I would say that if you poise yourself as a soldier even in a defensive fashion you also give the appearance of an offender. A bit of faith in life is essential for this scenario. It is not necessary to assume that other races will be as violence stricken or as deviant as our own. Kudos to you Joe for taking one of many first steps toward understanding! As a relatively ‘young’ sentient species, we’ve already proven that we lack the essential skills necessary to communicate with each OTHER, here in our own environment, let alone look to the heavens and ‘bark’ out our presense into the darkness. If our collective modern-day ‘tribes’ can’t even sit down and discuss our own differences with each other, and come up with the means to co-exist in peace and relative harmony, how on earth (every pun intended) would we react if we ever DID get a reply, to our messages beamed towards our neighboring star-systems ? No…Humanity is’nt ready to look ‘outward’ until we’re sufficiently evolved, after first looking INWARD, and learning who we are, and what (or ‘who’ ?) brought us here in the first place. Faith and Science = Yin and Yang, it is both inescapable and inevitable. Someday the answers will come…but only when we are READY for the answers. halted from contacting or visiting Earth? us and our ways and even share in some of these features and traits. different phyiscal and psychological makeups. would help to explain SETI’s lack of finding any signals yet. If our collective modern-day ‘tribes’ can’t even sit down and discuss our own differences with each other, and come up with the means to co-exist in peace and relative harmony, how on earth (every pun intended) would we react if we ever DID get a reply, to our messages beamed towards our neighboring star-systems . The first contact situation is anybodies guess. In regard to this being “poor astronomy and poor biology”, why would it be necessary in the first place that this becomes “excellent astronomy and excellent biology”? Why would artistic claims be evaluated by scientific standards? Why do you think that it is important for these claims to be verifiable? Does art have to be verifiable? Is there a possibility that Joe’s artistic insight is telling us something that no scientist is able to convey? I think absurdity is in the art here. Just looking at the Gene for the large RuBisCo subunit as a 1434-mer DNA molecule made me laugh. Caca gaga tata just popped out at me. Absurdists like Samuel Beckett had no qualms about describing completely useless interactions between human beings. What a laugh and a profound relief it is, and would be, to send a message to intelligent beings who were not there, whether from a burnt out star or simply that they were never there. It reminds me of Vladimir and Estragon in “Waiting for Godot” and calling out “Hello” and receiving no answer, but expecting an answer, when everyone in the audience knows by this time, Godot isn’t coming. The joy of the play and the challenge to humanity is how we treat each other while we are waiting for the answer. I like how serious the science is that is involved here, but mostly I like the big cosmic belly laugh I had thinking of it all in action. I sent you a contact. It’s been a year!!! Where are the insightful responses to my message? “Hello, Are you there” may actually have been from Endgame. Big deal! It’s a minor mistake. Sue me, I’m from another planet. Beckett, Bach, Belushi…I’m waiting for the sequel. Come on. I wouldlike to respond to all these comments that the signals you send out may frustrate and infuriate the likely recipient. Maybe you should consider that if anE.T. did exist and recieved your signal they have no interest in communication for your gain.